Challenge…accepted. 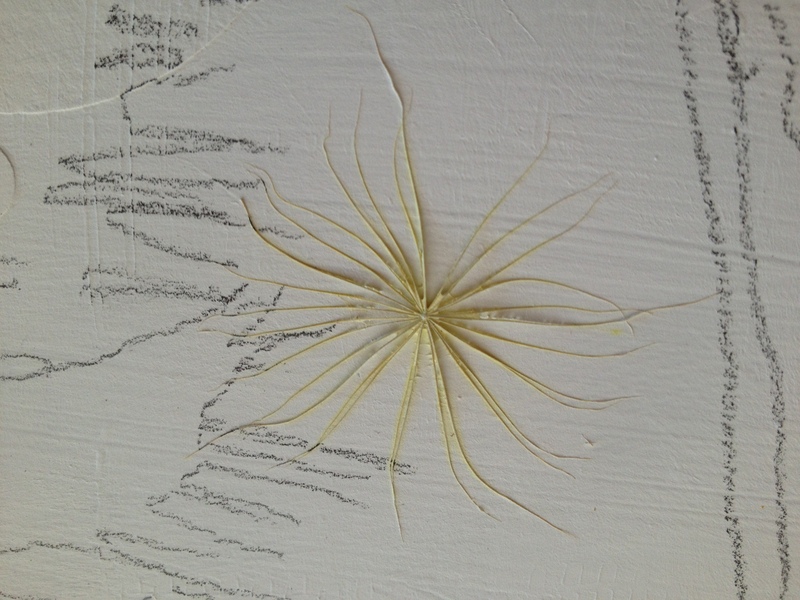 As I walked past a salsify plant, I asked myself, “Could you paint that, Sarah? How? What would it look like?” And so the challenge was made and accepted. First step, let’s take a quick photo with my IPhone and print the photo in the detective lab, do some DNA testing and see where we’re at (just kidding…too many detective shows for me). How the heck am I going to do this?! But, since I had accepted my own challenge, there would be no going back. I call this plant a “wish” plant (maybe, as in, I wish I could paint it?). 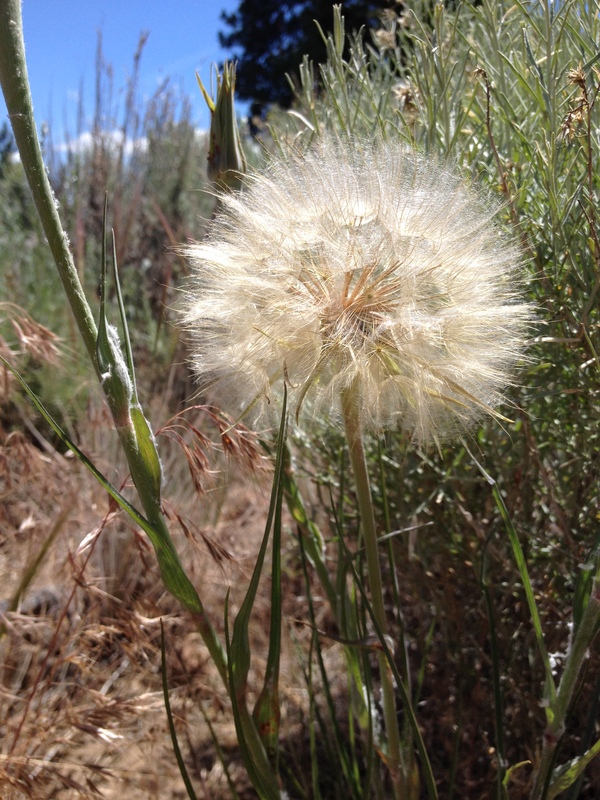 Which, if you were a tiny fly buzzing around my childhood, you would have known that we would blow on the plant and make a wish as the little poofy seed-heads floated off on the breeze. Don’t ask me why or how, but the wish was supposed to come true if all the seed heads came off during the lung-induced gale. Maybe that’s why I never got my pink mustang? You know, the car? Or…maybe it was my breath? Oh, but I do digress. So, as I was contemplating how on earth I would try to convey the airy-ness, the shadows and highlights, the seed heads, and still convey the wishy-wish aspect of the plant, I had a brain storm. Ooooo! Insert SEED HEADS!! 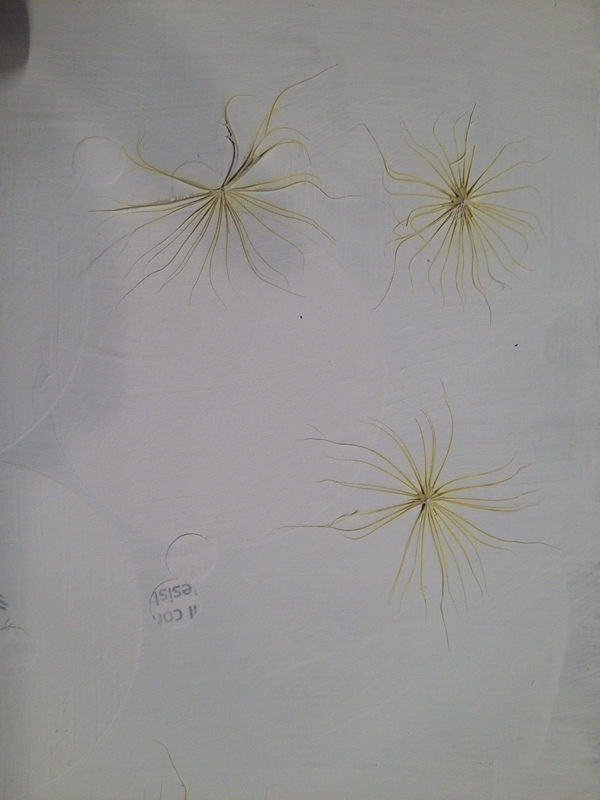 Since the plant was still somewhat intact when I began this painting, I was able to go outside and gather the little buggers. 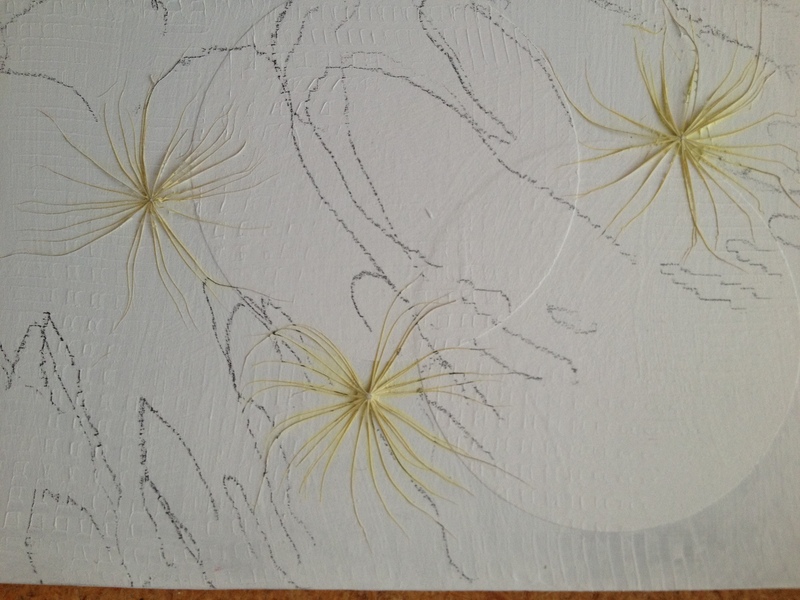 You got it…the painting has seed heads from the wish plant IN THE GESSO! I love it! 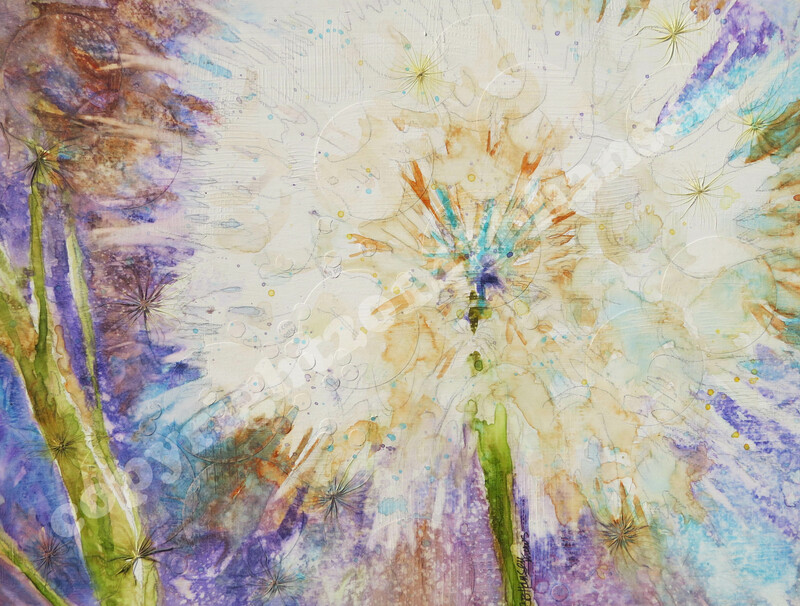 I carefully chose perfect little seed heads, but when I put them into the wet gesso, they mushed together and didn’t spread out like I wanted them too. Since the little seed part was too pronounced, I plucked the seed and the stem off, and used just the “parachute” part. I also worked on keeping the individual parachute parts spread out. If some weren’t perfect, that was fine. In fact, preferred. I let it dry. You can see from the photos above that the seed heads retain their original color. 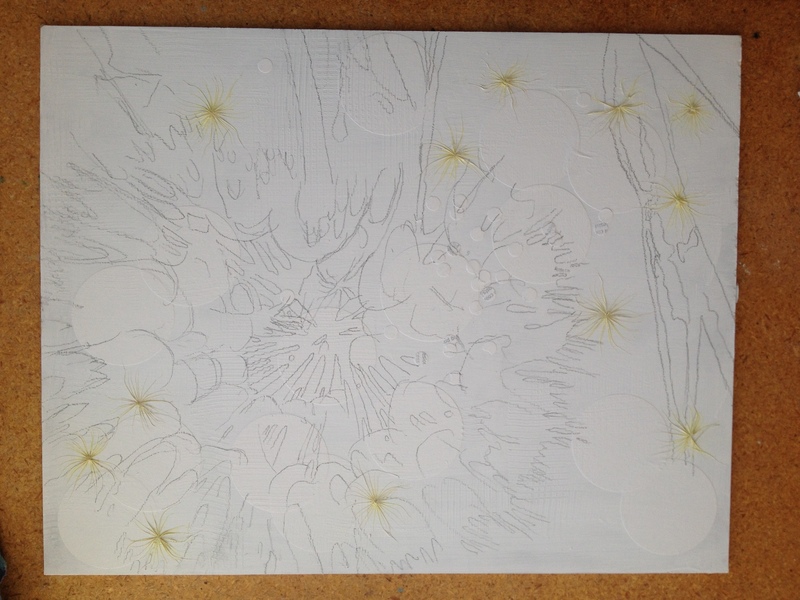 Even after the gesso covered them completely, once it dried, the yellow tint remained true. Then, I went to Colorado with my prepared Plexiglass. Read: Painting BONANZA!! At home, I had used my 1.5 circular die cut press to create some circles out of paper and had placed them around the painting. Now, when I began to paint, I used Daniel Smith’s Cobalt Violet, Cobalt Teal, Quinacridone Burnt Orange to establish the circular wishy-shape plant. When I went into the upper LH corner with some of the deeper, darker color, the circular shapes reminded me of moonlight. Hence the title. What do ya’ll think? I’m pretty happy with the way it turned out. I was aiming for explosive poofs everywhere, and like the background color. Overall it’s pretty fun. Want it? Let me know. And follow my blog (scroll down and click follow) and my Facebook page to keep up to date on all the happenings. Take care everyone. Feed the beast!